As it was our first wedding anniversary on Monday we decided to use the whole weekend to celebrate. Pete suggested we go to Stratford-Upon-Avon during the day as we don't go very often but it's a very pretty place with some interesting shops and a wide range of places to eat. 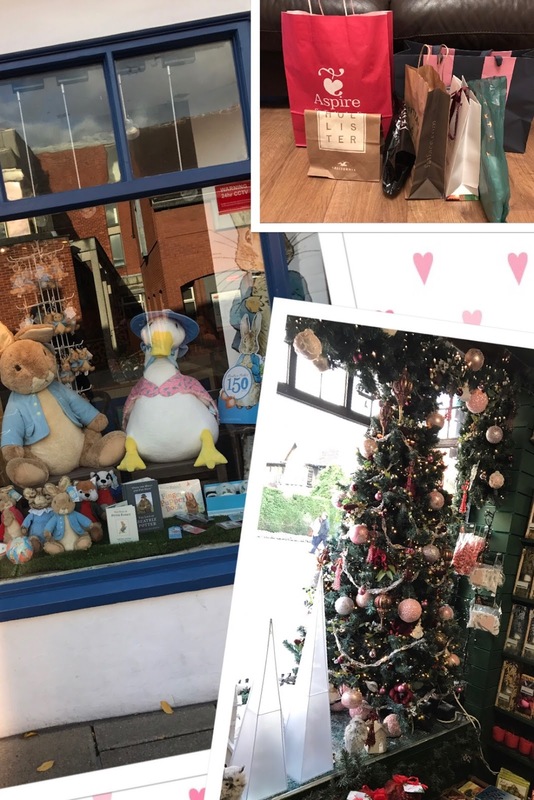 It's the sort of place that you could easily go to and just walk around but we decided we wanted to do a spot of shopping, including going in a couple of my favorites - the Christmas shop and Peter Rabbit shop which are on the picturesque Henley Street. We didn't stop anywhere fancy for lunch, we just stopped in for some pub grub as we were walking round but that was something we like, there is a big variety of places to eat so if you want something basic like we did then there is plenty available but there are also a wide range of 'posh' restaurants too. For the evening we went to the Baginton fireworks display. I am a massive lover of bonfire night so works out well for me that there are lots of display options around our anniversary. The display we went to had an amazing bonfire and food on the go but the display itself was much smaller than when I went previously, the fireworks were very small and lasted a very short amount of time. We did get a spectacular view over Coventry on the walk back to the car though as you could see for miles with several firework displays going on over the city. The following day we had booked a table at the Queen and Castle in Kenilworth which was amazing. It's a beautiful place situated right next to the castle, the food was spectacular and couldn't ask for more from the staff. We were in there a few hours as we ended up having three courses and a bit of a natter. There was a pretty outdoor section but as it was bitterly cold and wet we stuck to indoors. We finished off the weekend going to the cinema, we are both massive fans of the Marvel films and Dr Strange had come out so we decided we would enjoy the evening going to see it. We both really enjoyed the film, it was a little weird in parts but overall at was brilliant and now we can't wait for Thor & Guardians of the Galaxy next year. Anniversary tip - The only real tip I can give here is to give the day a bit of thought in advance, especially if you decide you want to go away somewhere. What you want to do for your anniversary is personal to you as a couple but spend a bit of time thinking about what you both like so when it comes you have everything planned and you can just take it in and enjoy it.